Discover the profit secret that is sure to create more profit for your business. A little known secret that will get you more profit. James Schramko here with part three of my business profit tip series. In the first part, I talked about adding a high price product to your product lineup. In the second part, I talked about adding a recurring element to your product lineup. And in today’s episode, I’m going to tell you a pretty unknown secret that is really really helpful if you have a business. It’s going to create you profit so watch on. Alright so this is part three. This is probably a not expected tip and maybe a little controversial. But what you should do is look for your product services lineup, and find something that you can sell that people may never use. What?! Yeah, find something that you can sell that people may never consume or use. An example of this: I have an Internet subscription to connect to the Internet from my house. Each month it allows me up to 500 gigabytes allowance. Now if I only use 50 gigabytes or a hundred gigabytes, the other 400 gigabytes just vanish. They go away. And the chances are, I’m not going to miss them because I’ve paid for them but i’m not using them. Same with my telephone bill. I get a capped plan that allows me to use up to X amount of calls or SMSs. Now if I don’t use it all, it just disappears. So, the telephone company and the Internet service provider are on to something pretty tricky. What could you provide a supply that people pay for but don’t necessarily use. They can use it if they want. But if they don’t, it’s not a big deal for you and it’s not a big deal for them. 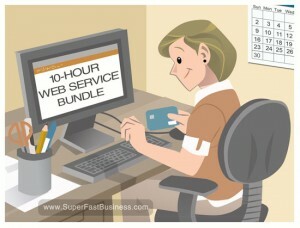 So an example of that might be selling hourly packages for a service that you do. Instead of just selling appointment by appointment, sell blocks of 10 appointments, or blocks of 10 hours. And now when people buy that, a) you get paid upfront; b) you’ve never had to deliver all of the hours at the same time as when you get paid; and c) a lot of people will probably just disappear and not even consume those hours which you can resell because you have capacity to someone else and get paid twice for the same resource. So, hope you’ve enjoyed this tip. I’d love to get your comments on this. This is typical of the sort of stuff I talk about inside SuperFastBusiness and SilverCircle which are my business coaching memberships. I look forward to catching up with you on the next lesson. I’m James Schramko. Very clever. Just trying to think of ways to productize this for online. Obviously you can do it for consulting but how to do it online? Hopefully those who use this tip use it to enrich their customers lives, while also making a profit. Hey James. I think this is definitely toeing the line of dodginess for me. I guess it depends on how you look at it but most of your content encourages people to create great value for the world which I love about your message. This doesn’t. I know what you are getting at here and I don’t think it needs to be put as “getting paid twice for the same thing” (which sounds dodgy as hell). If you look at the phone company example. The reason they give you $500 in free calls isn’t because they know you won’t use it. It’s because they know you care about not having to worry about it. So they aren’t selling $500 worth of calls. They are selling the benefit of not having to worry about your calls anymore and they are risking that you’ll use the full quota (a low risk with their data). I think you could have positioned this as – what can you risk in order to ease people’s concerns. i.e. if you offer hosting can you offer 2 gig a month so people know they don’t need to worry about disk space. If you offer consulting can you give people 2 hours per month in a recurring package so they know that if they ever have an issue all they have to do is call. You are ‘risking’ that people will use the full quota but you as the expert know that this is a low risk. I think that is what you meant here but it came across as borderline dodgy for me (and I say that with the most respect). Dan think about insurance companies. They sell piece of mind and the potential to pay out if required on a claim. They effectively re-sell that potential over and over again. I guuess Lottery companies sell the potential of hope with tickets. There are plenty of ways to sell things that ‘may not’ be used. Even the all-you-can-eat menu at the restaurant. The resources can be used by different customers in different portion sizes. It was worth opening this can of worms if not to just stretch our though patterns. When I sell things I want people to consume the goods and services. Often people will buy but not consume. Sites like Groupon also experience people buying things yet never redeeming them. Dan I see what you’re saying, however I think positioning the concept in the way James did, made it really simple to understand. “what can you risk in order to ease people’s concerns.” helps someone construct the message toe their customers but doesn’t really help explain the strategy itself. If the goal of this video was to get the reader thinking about the strategy, mission accomplished. Gym membership are a classic for this… Gyms will always over subscribe their memberships because they know that a percentage of people will just not rock up. Thanks James, you have me thinking….